It was May, 2008 when we lost a dear Dave's Garden friend who lived in Alaska. Several of us had known Carol Eads very well through her posts on DG, and our hearts were hurting when she passed. But the story does not end there. I traveled to Alaska to build a Memory Garden for Carol, and in doing so, I discovered a whole new world filled with wonderful people and unusual things....here's my story. 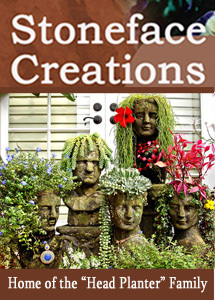 Here's several reasons why this "Container Freak" loves gardening in planters. For the impatient Souls amongst us, including myself…I don’t know of too many gardening projects that can provide such “instant gratification”. It's Container Planting time and whether you’re selecting plants for a splash of color in a shady corner or for an entire garden of mixed containers, here's just a few ideas to help you with your selections. In part 1 of this article we talked about plant selection, the importance of planting “like with like” and container location.Here's a few tips and considerations when selecting containers for your beautiful plantings. Container Gardens are one of the fastest growing segments of gardening these days. Come on in and share ideas and gain some new ones.Everybody is welcome!